What was once used by players as the standard, plastic fixed steel axle butterfly yo-yo for more than 35 years, was finally updated in 2016. This latest version came in four new hubcap designs that came in three colors: red, blue, and gray. The steel axle on older models was also replaced with a longer spinning plastic, transaxle bearing sleeve like those found on the Yomega Fireball. Today, the Wheels model is considered a beginner yo-yo. 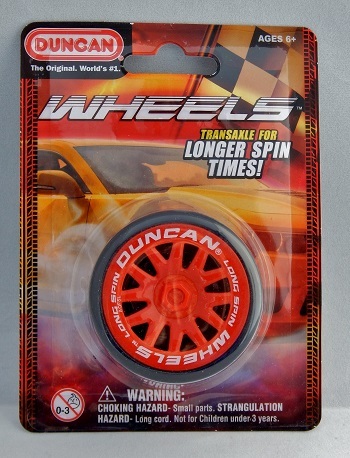 Oddly enough, the Wheels yo-yo has not been a promoted yo-yo on Duncan's own website since its release in 2016. While the yo-yo appeared in Duncan's 2018 online catalog in PDF, it currently (as of January 5, 2019) does not appear on their website. Black body, red spoked rims with a single molded "hex nut" shape in the hub area (Rim style 1). Original retail price: $6 US.